If you are already a part of the SAM Broadcaster Cloud family, you probably know all about SAM Cloud’s array of features, and if you are planning on signing up, you will soon find out. SAM Cloud has a ton of really cool features, like Automation Scheduling, Live Streaming, and Automatic Fail-Over should your live stream drop. One of the most appreciated features is by far the free hosted player page that comes with your SAM Cloud subscription. It’s fully hosted, free, and mobile-friendly, but one of the best things about the player page included with your SAM Cloud subscription is that it is fully customizable. Customizing your station player page helps make it your own as well as cater to your listeners. You can customize your station’s free hosted player page based on the station’s genre, or even to your radio persona – it’s up to you. Listeners are more likely to appreciate a customized site that reflects their favorite music genre or the persona of their favorite DJs, rather than a dull, anonymous, and arguably boring website that gives nothing away. To start customizing your player page, simply log in to SAM Cloud and select your station. Then click on the Widgets Tab as shown below. Once the Widget Tab is displayed, you can select the Customize Player Site under the Free Hosted Website heading. You will then see an extensive customization menu that we will briefly look at below. Here you can toggle your menu display between a classic or a compact display. You can also change the color scheme of the default and active items on your site menu. Here you can change the background color, as well as the color of your text and station name. In the Now Playing tab, you can select the background colour of your Now Playing section, as well as upload a background image, choose the background size and change the color of other aspects like text color, etc. In the Main tab, you can control the primary color scheme for your site, as well as a choice of a landing page, which is the first page that your listeners will see upon visiting your page. The Widgets tab allows you to control some of the details related to the widgets you add to your site. These details include things like the theme, media library limit, coming up limit, and whether or not you want to show a scheduled timeline. Stay tuned for a closer look at our widgets! 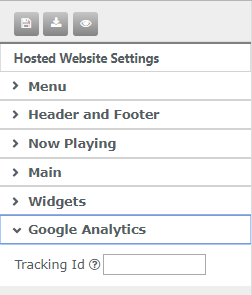 Here you can enter your Google Analytics Tracking ID. There is an array of customizable widgets that you can add to your own station website to help make it your own and enhance the overall experience for your visitors. These include widgets for displaying Station Information, Recently Played Tracks, Now Playing Information, Your Media Library, Now Playing Dedications and more (as can be seen in the image below). It also allows you to set the limits for your Media Library, Coming Up, Recently Played etc. You can also choose whether or not you want to display Album Cover Art and Buy Buttons, as well as controlling the theme. To generate your widget code, simply select the required, configurable widget options from the ‘Web Widgets’ and click ‘Generate‘ to bring up a preview. When you are satisfied with the way that your chosen Widgets look, just copy and paste the code into your website. We also aid you in generating links with which you can share your station with listeners in external players. These links can also be used to subscribe to online directories like TuneIn. We hope you have a ton of fun making your station’s free hosted player page your own. We know your listeners will love it and will love seeing your site’s look evolve along with you. SAM Cloud sounds pretty cool, huh? Well, you can try out a free trial or get your very own subscription here.